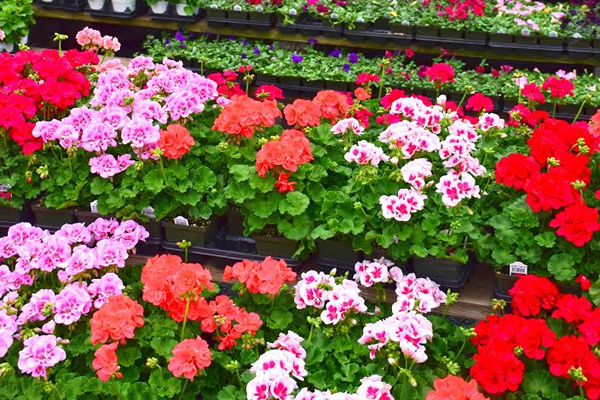 Merrifield Garden Center offers an array of colorful plants. Spring is an excellent season to fertilize your flowering trees, shrubs and perennials with Merrifield Flowering Plant Food. Use Merrifield Tree and Shrub Food for lush, green growth on evergreens and shade trees. Before adding fresh mulch to your flower beds, apply a weed preventer such as Preen, Amaze or an organic alternative – corn gluten meal. The first impression of your home is your landscape. Create eye-catching curb appeal with beautiful foundation plantings, a thick green lawn and lots of gorgeous color. Hanging baskets and container gardens add spectacular color. When creating a container garden, use Merrifield Potting Mix and Soil Moist – a water-grabbing polymer that absorbs excess water and releases it into the soil when needed. Visit our display gardens to get great ideas for your landscape. Continue planting your edible garden. Now’s a great time to plant basil, beans, corn, cucumbers, garlic, onions, squash, tomatoes and much more. Keep your rose bushes on a spray program with Rose Shield or Neem Oil for gorgeous blooms and healthy plants. Trees are Mother Nature’s natural purifiers, absorbing carbon dioxide and releasing clean oxygen into the air. You may be planting trees to beautify your landscape, but you’re also helping to protect the earth. We carry a magnificent selection of trees for every style and budget. Time to plant apple, pear, peach and other fruit trees. Fruit trees require two different varieties to pollinate properly. Please ask one of our plant experts to guide you selecting varieties. May through early June is an ideal time to fertilize your lawn with Merrifield Premium Lawn Food to keep it green and healthy. Control weeds in your lawn with Weed Beater Ultra or Speed Zone. If you seeded your lawn this spring, you must wait until the new grass has germinated and been mowed two to three times before applying. Always follow label instructions.